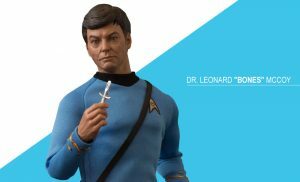 Continuing to celebrate the 50th anniversary of Star Trek™: The Original Series (TOS), Quantum Mechanix adds your favorite curmudgeonly old doctor to their Master Series articulated figure line! Dr. Leonard “Bones” McCoy was the chief medical officer of the starship Enterprise for her five-year mission. This sixth scale figure re-creates this iconic character in exquisite detail. Standing approximately 12 inches tall, every element, from his 23rd-century tunic to his custom black boots, is authentically reproduced. The original portrait sculpt of DeForest Kelley as Dr. McCoy has an authentic, hand-painted likeness. He comes with his away medkit, phaser, tricorder and communicator and a variety of hands for hundreds of display options. A Star Trek Delta symbol display base will support the good doctor in a variety of poses.